Language is always changing. Languages evolve to meet the cultural and social needs of their speakers. Languages evolve very rapidly, which is why when you read the US Constitution it sounds funny. It’s also why so many people have a hard time reading Shakespeare. The English language has changed a lot in the last few hundred years. Heck, if you had told someone to “just google it” twenty years ago they’d probably be confused, if not slightly offended. 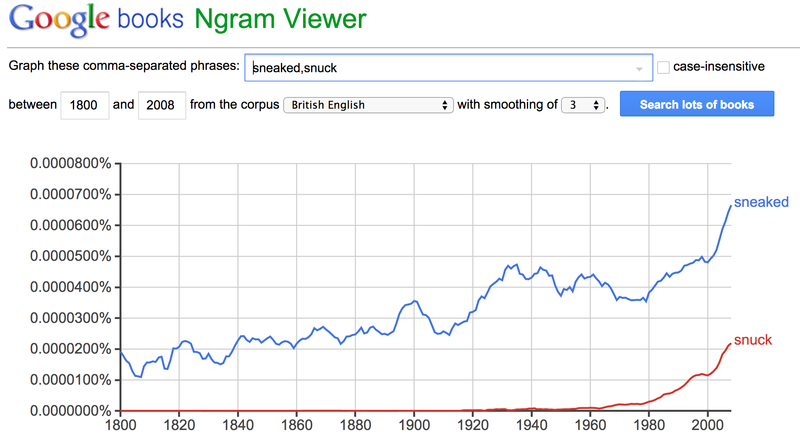 You can trace the history and usage of a word over time using Google Ngrams, which is my go-to resource for settling debates like the above. You can learn more about the development of Google Ngrams by watching this awesome and hilarious TED talk. 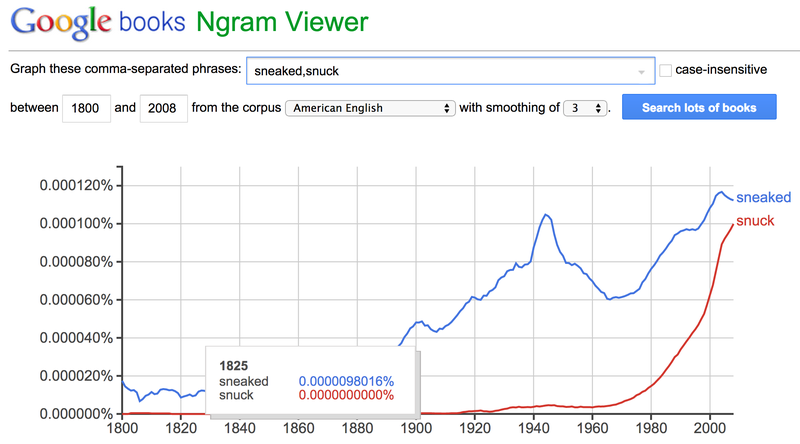 Overall, it seems that sneaked dominates the usage in all varieties of English, and snuck didn’t come onto the scene until the 1920’s, but it’s gaining ground. Here, snuck didn’t really start gaining traction until the 1960’s. And as of 2008, the latest year for which Google has data, it’s still less favored than sneaked in the United Kingdom. But what about us Yanks? Now here’s some interesting data! 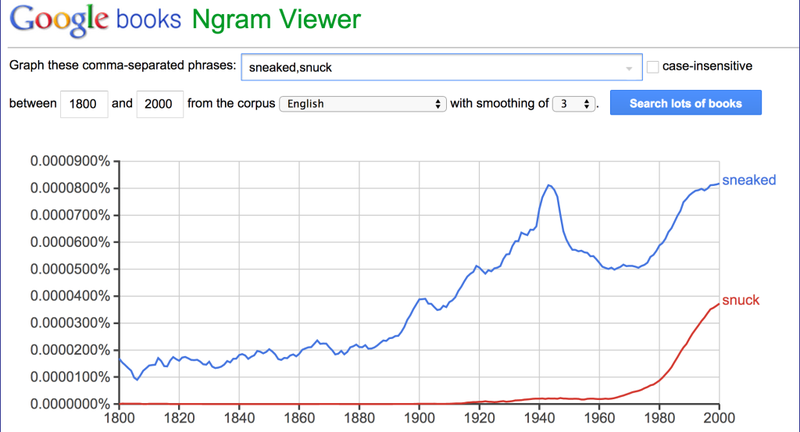 Sneaked seemed to reach a peak in the early 2000’s, and snuck is rapidly catching up to it. Pretty soon these two alternative past tenses might reach an equilibrium, and snuck could become the standard way to say this in the United States. In fact, since this data is already 6 years old, I wouldn’t be surprised if we’ve already reached that point, which is why TV hosts like Conan are saying it.